I've always held homemade cinnamon rolls up as the standard by which to judge myself as a baker. If I could pull off baking cinnamon rolls then I had arrived as an expert baker. Until the weekend when I made my first attempt at homemade cinnamon rolls, I had considered myself a baking failure not because I was unsuccessful at making cinnamon rolls, but because I had never gotten up the nerve to even try to make them. When the cookbook, I Love Cinnamon Rolls, fell into my hands, I knew that I had to overcome my fears and tackle the baked good that I feared the most - the cinnamon roll. The cookbook is divided into nine chapters with something for everyone: In the Dough, Easy Cinnamon Rolls, Old-Fashioned Cinnamon Rolls, No-Knead Cinnamon Rolls, Thin Strudel Dough Cinnamon Rolls, Vegan Cinnamon Rolls, Whole Wheat Cinnamon Rolls, Gluten-Free Cinnamon Rolls, and Danish Pastries. There are eight different doughs to choose from based on your baking expertise and dietary requirements. The following chapters include recipes using the different types of dough. Of course, the fillings can be mixed and matched to your taste preferences. And, you'll find plenty of choices that will appeal to you such as Pineapple Upside-down Cinnamon Rolls, Rocky Road Cinnamon Rolls, Cinnamon Honey Buns, Festive Cranberry-Orange Cinnamon Rolls, and Carrot Cake Cinnamon Rolls with Pineapple-Cream Cheese Frosting. The last chapter contains recipes for Danish Pastries such as Cinnamon Bear Claws and Pain au Chocolat Cinnamon Rolls. Each recipe has detailed, easy-to-follow instructions and the majority of recipes are accompanied by beautiful full-color photos. I chose to mix and match recipes to create a cinnamon roll that appealed to me on every level. First, I chose the dough, Easy Cinnamon Roll Dough. Next, I chose the Classic Cinnamon Rolls filling. Finally, I couldn't resist a frosting called Gooey Frosting. 1. In a 4-cup measuring cup, combine the water, sugar, and butter and whisk to blend. Microwave on high for 1 minute until warm, then whisk in the egg and egg yolk until the butter melts. 2. In a large bowl, empty the flour packet from the hot roll mix. Add the contents of the yeast packet and stir together with a fork. Stir in the liquid ingredients until you have a soft dough. 3. Flour your hands and a flat surface. Transfer the dough to the floured surface and form into a ball. Adding as little flour as necessary, knead the dough by pressing the dough into an oval, folding the oval in half, and pressing several times with your knuckles or heel of your hand. Turn the dough a quarter turn, press into an oval and repeat the process. Sprinkle with just enough flour to keep the dough from being sticky. When the dough is smooth and springs back when you press it with your finger, you've kneaded enough (3 to 5 minutes). Return the dough to the bowl. Let the dough rest for 15 minutes. 4. 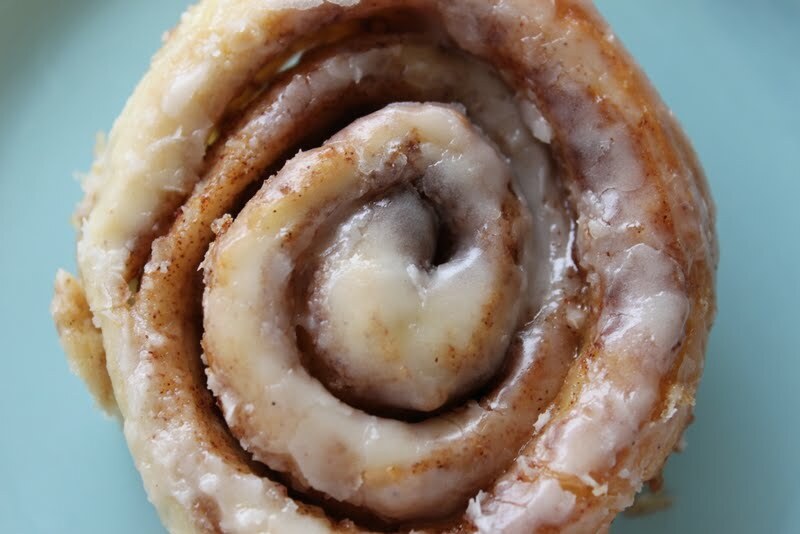 Proceed with a cinnamon roll recipe. 1. For the pan sauce, spread the butter into the bottom of a 9-by-13-inch pan. 2. Transfer the dough to a floured surface and roll out to a 16 by 20-inch rectangle. 3. For the filling, combine the brown sugar and cinnamon in a bowl. Spread the dough with the butter and sprinkle with cinnamon sugar. Starting with a shorter side, roll up the dough to form a tight 16-inch cylinder. Cut the cylinder into 12 rolls. Place in the prepared pan spiral side up. Cover with a tea towel and let rise in a warm place until almost doubled, 45 to 60 minutes. 4. Preheat the oven to 350 degrees. Bake for 15 to 17 minutes or until lightly browned on top. 5. For the frosting, blend all the ingredients in the bowl of a food processor until smooth. Spread the frosting over the warm rolls. Were my cinnamon rolls perfect? No, but it was definitely a learning process. I didn't have my dough rolled out in an even rectangle so I ended up with two tiny cinnamon rolls on the ends when I sliced the dough. Did that matter? No! I considered those to be the baker's treat. The most important thing is that while my cinnamon rolls didn't look perfect, they tasted great and I know how I can improve them the next time I make them. And, I Love Cinnamon Rolls gave me the confidence I needed to begin mastering this wonderful baked good. This cookbook sounds so fun! Where do you find hot roll mix? I have never seen or bought that before? I found the hot roll mix at Kroger. It's made by Pillsbury and is in the baking section of the grocery store. Oh my gosh - YUM! I want that book! I absolutely love cinnamon rolls but they kind of intimidate me too. Yours look fantastic!!! 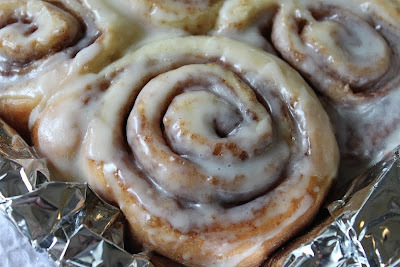 These cinnamon rolls look absolutely perfect!